bundesliga.com: Thomas Müller, how does one go about being a professional footballer without muscles? bundesliga.com: So you do have muscles? Müller: (laughs) The secret's out. But in all seriousness I've also been thinking about why I haven't had more injuries. There are definitely a lot of players whose muscles are different to mine. Perhaps I’m one of the tough ones. bundesliga.com: And so what's the secret to your lack of muscle injuries? Müller: There isn't one. Often it's just 50/50. If it ever does get a bit rough in training, then I think it's more sensible to be a bit more cautious. It might be different in a game, of course, sometimes you have to take more risks. Basically, it's about judging situations correctly during a game. If there's no other way around it and the opposition player is coming at you at pace then sometimes the only thing to do is jump out of the way. It might catch the eye and sometimes commentators might say that you've got out of the way too early but I think that's just basic self-protection. If you're out of the way, the risk of being injured is obviously lower (laughs). That's if it goes well of course! bundesliga.com: You are regarded as an unconventional player and you’re often found where others aren’t on the field. Would you say you thrive on disorder? Müller: Again, there's not really a secret. I just try to find the space where there's no opponent. Teams often line up against us with five at the back, which means you're up against three centre-halves all 1.90 metres tall. There's no space in the box so you have to find other ways round because you're not going to come out on top in a one-on-one with them. It's basically about good organisation in the box. bundesliga.com: What do you mean? Müller: Well we're not just buzzing around for no reason. It's all about the right timing and, within that, not standing directly behind your strike partner. bundesliga.com: So the Müller style is all about finding space? 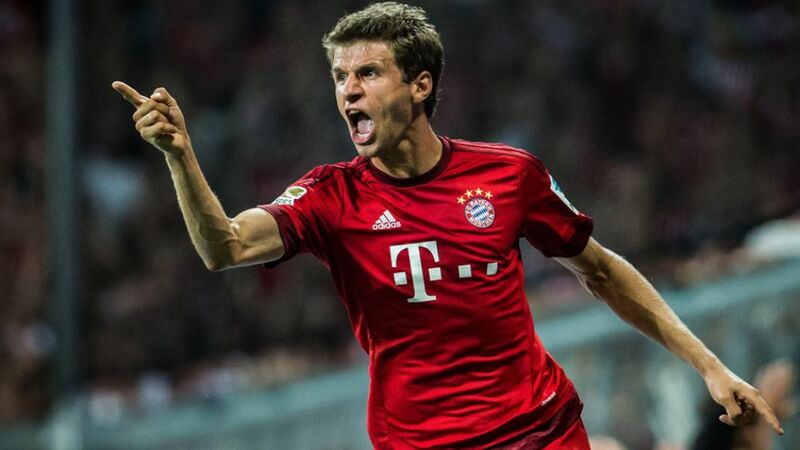 Müller: Well that's not just my style, that's important for any striker. Anticipating what's going to happen is important. I suppose you could sum it up as trying to see what's happening and then reacting accordingly. Müller: (laughs) So I've heard. Given a bit of time you start to click together and then I develop a feeling for where I have to go at a given moment and to look for the team-mate who's in the best position. bundesliga.com: Speaking of being in a good position, Bayern drew 2-2 with Juventus in the first leg in the Champions Round of 16. Does that mean the Italians will have to be more attacking in the second leg on Wednesday? Müller: No, I don't think so. One goal could be enough for Juventus to qualify if we don't score. I expect them to play as they did in the first leg. But it's always important to be prepared for anything. And we are. Müller: Have I missed something? All I know is that we're playing Juventus on Wednesday so to talk about what comes after that feels a bit strange. On Wednesday we're going to have to be completely focussed. Juve are an excellent team and were in the final last season. For us the Champions League only runs until Wednesday. Then we'll see what happens. Müller: We share the same aims, which is what we're working towards. The summer is a long way away, and there's EURO 2016 to consider, too. In the Champions League and in the EUROs there are a lot of very good teams who have similar targets to us. To be the best at the end of that is very special. So, just like the other teams, that’s what we're aiming for. bundesliga.com: Wouldn't that mean that it makes little sense to have a very specific plan for each match and to follow it to the letter? Müller: I think that would reduce your chances of victory. We have shown before that we're prepared for anything and I think the best method is probably to have several different tactical approaches and then vary them according to how the game pans out. That will certainly be the case on Wednesday. Thomas Müller was speaking to Oliver Trust.